Other | Hunting & Wildlife | Inventory | A&A Engraving, Inc. Hunting & Wildlife > Other Sportsmen's Clubs & Assoc. This .45 edition was exclusive to members of the Sioux County, IA Sportsmen's Club in celebration of their 20th Year Anniversary. Finish: Deluxe 5-tone finish on a modern frosted nickel base with custom engraved metal grips. Individually numbered. 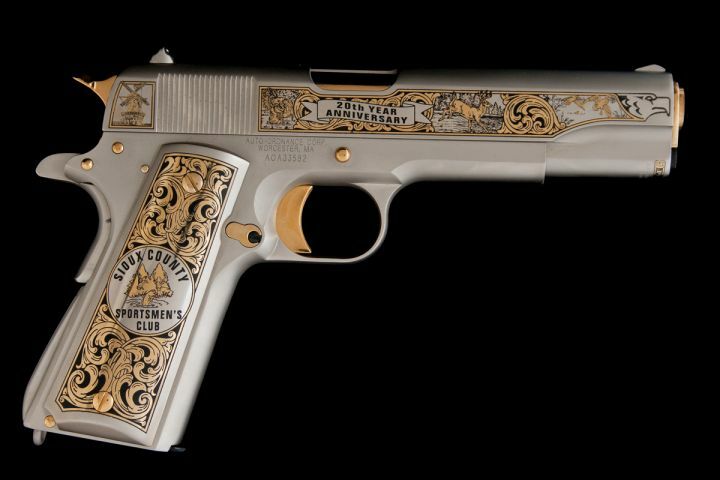 Includes: Original Kahr Arms box w/paperwork, numbered & signed Certificate of Authenticity. Handmade oak display case included.